Last weekend after church my husband and I took a fall drive to see the fall colors. You can read all about our adventure on Wednesday's Travel Post. I dressed in an outfit that would be both appropriate to wear to church, but one that I could hike a short distance in as well. Little did I know then how much Mother Nature and I would match! The weather was in the low fifties and a little windy so I dressed in layers to keep warm. Would you believe I bought this blanket scarf two years ago and this is the first time I ever worn it? 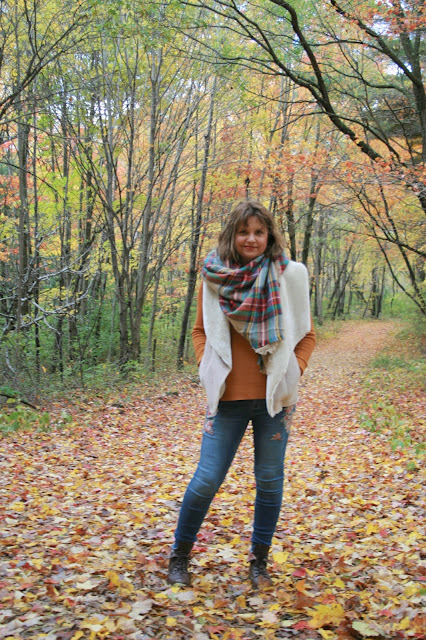 I love the look of a blanket scarf, but I find them way too cumbersome for everyday wear. However, it was THE PERFECT accessory to wear this day! It kept me so toasty warm from the cool fall air, and it wasn't a pain to wear because I wore it for a long period outdoors. Most of my daily life involves running from a car to a building, and a blanket scarf is just too difficult to deal with for that. But if you're outdoors for a longer length of time...it's perfect! My suede vest I bought a season or more ago. I've shown it to you many times before HERE, HERE, HERE, and HERE. It's the best suede vest I've ever seen. It is so well made, nice and thick, and very warm. I love the fur lining. I use it more as a jacket, removing it when I'm indoors. When I was in church, I only wore the sweater. This is a new sweater I just picked up at A'GACI. It's a store at the Mall of America that my husband and I always love to stop in whenever we're there. They have an on-line store too, but it seems a lot of the items on-line aren't the same as in the store. I love both the color and the lace up detail of this sweater. 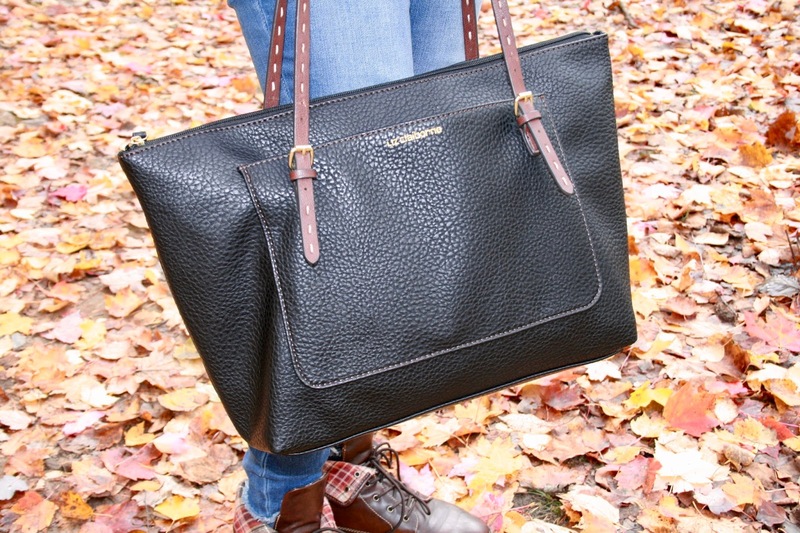 Could this color be any more perfect for fall? I just bought this sweater less than two weeks ago and would you believe I already can't find it anymore on-line? So sorry! I wore my new a.n.a Embroidered Jegging that you have been seeing constantly since I bought them. I swear, I haven't taken these jeggings off since I purchased them! They are just so comfortable, I LOVE them! They are my favorite pair of jeans that I own. Here is a close up of the lace up detail in the sweater. I did wear a blue tank underneath for modesty and warmth reasons. For jewelry, I chose a simple necklace (Stitch Fix, Old) that wouldn't compete with the lace up detail in the sweater, and a tortoise shell and gold bracelet and rings. I picked up the unique tortoise shell bracelet on clearance for only around $3.00 at JCPenney. My blanket scarf I got on Amazon. I wore old combat boots because I knew I would be hiking today. They have a unique plaid fabric inside the shoe. You can choose to wear them up or fold them down to reveal the plaid fabric. I did carry a handbag into church, but no, I didn't carry it while hiking. We walked a short ways down the path to take photos with the bag, then my sweet husband ran it back to the car for me. That's why some of my pictures I'm holding a bag and in others I am not. The blanket scarf is huge, yet I still managed to take it off and put it back on again without a mirror quite easily while doing this photograph shoot. If you never tried a blanket scarf before, it is just a big square that you fold into a triangle. You place the triangle portion down over your chest swinging the ends over your shoulder, criss cross behind your neck, and then back down the front again. You can then tuck the ends under the triangle portion so you can't see them, or leave them hanging out. Some of my pictures show the ends hanging out, and some have them tucked under. So what about you? Have you tried wearing a blanket scarf yet? What do you think of them? I'd love to hear from you! 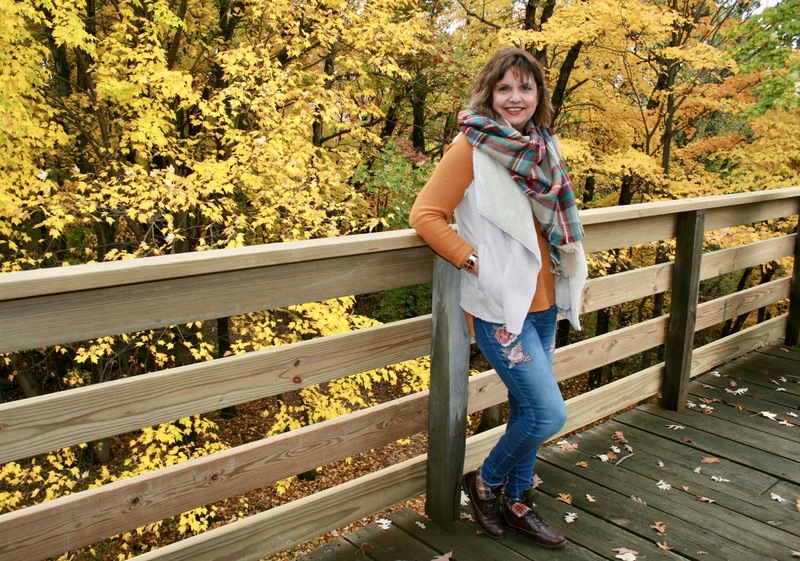 Gorgeous fall colors in your outfit Amy! I haven't had a chance to rock my blanket scarves yet, but I'm so excited to! Thanks Brooke! This was the first day this year I could break one out too. Now it's been back in the 70s all week! I can't get over those beautiful fall colors Amy, and the leaves on the ground look like mother nature rolled out a beautiful carpet! Gorgeous outfit too, everything matches so beautifully, how fun that the fabric details in the shoes match the pattern and colors of the scarf so well! I've had my eyes on similar shoes but kept thinking I am too old for them...thanks to your post I might just get them! I know, and they were even more beautiful IRL; photos don't do them justice. Too old for combat boots? Never! 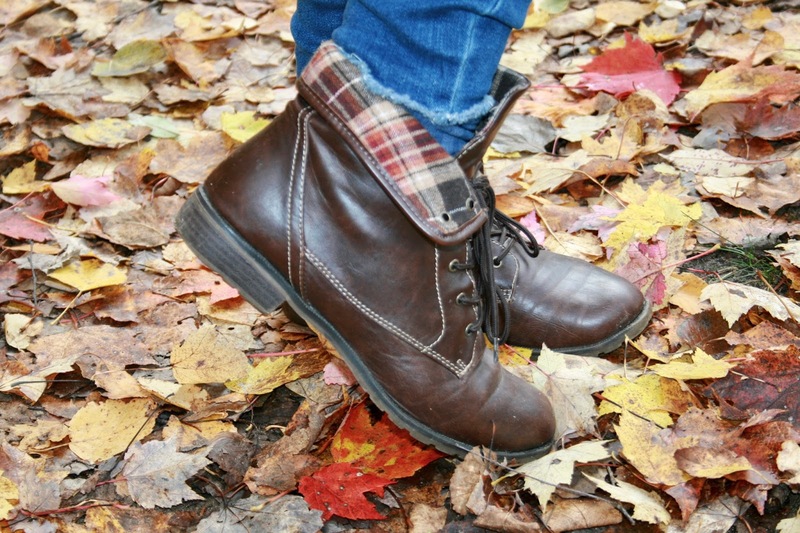 You need them for winter wear and hiking! Thanks Lisa. I felt I was in a magical postcard land when we were in this forest. It was so beautiful! I love a.n.a too! Gorgeous you. This is a perfect opportunity to wear that blanket scarf and it is the perfect color to go with the background palette. I am also digging that vest. So cute. Thank you! I wish I had a link to the vest, but I purchased it years ago! I loved this outfit on your travel post. The colours are just perfect. I almost bought a blanket scarf last year, maybe this year will be my year. Hugs, x. Thank you! You're climate might be a tad too warm for one, but I've seen other bloggers wear them as shawls and belt them so that might work for you too! 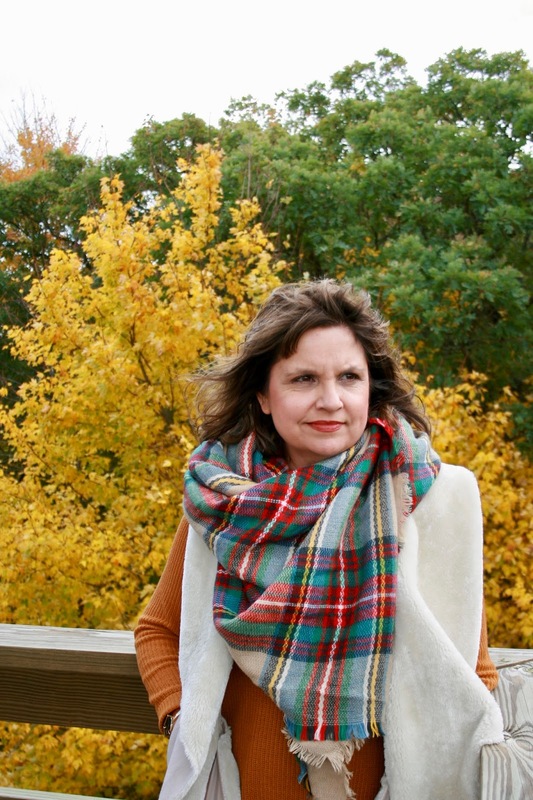 This plaid blanket scarf is a classic! It's a great fall/winter essential. Your lace-up sweater top looks great too. This blanket scarf is so cute! I love that you paired it with that sweater. It adds such a nice pop of color. I could totally see myself wearing this. Thanks Sheree! If you can see yourself wearing this, then I know for sure I put together a great outfit for your fashion style is amazing! 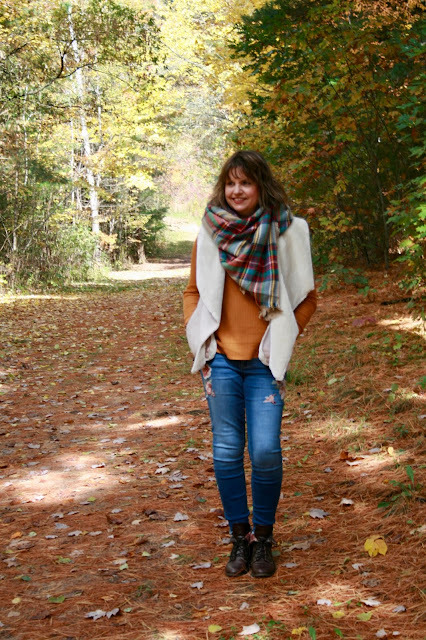 Blanket scarves are so cozy for fall. I have one like this and just love it! I really love the sweater you wore with it! Thanks for linking up to Top of the World Style. 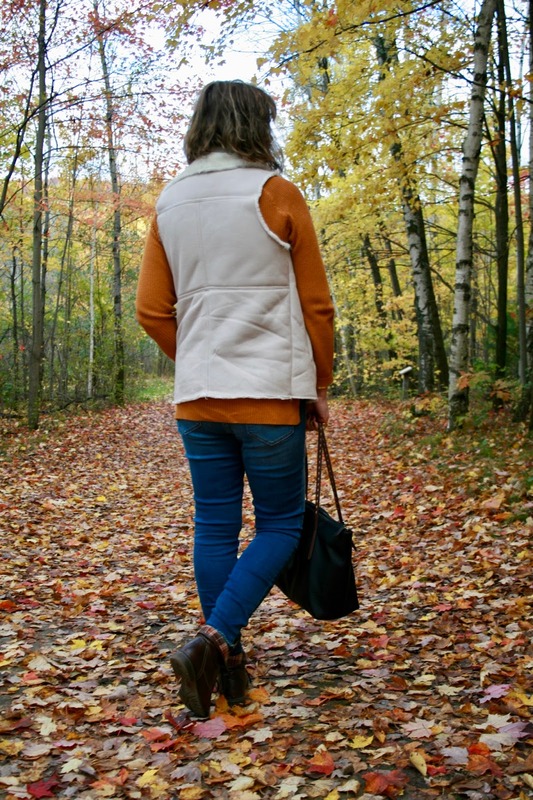 this look is perfect for a walk in fall. So cozy and chic.